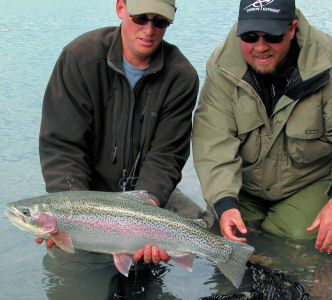 Many people want to know when the best time to come fly-fishing on the Kenai River is. As far as I am concerned, whenever you can come, do it. Here are some highlights for June. Our regular season opens on June 11. It is a great time for a crack at some big post spawn rainbows. Sockeye Salmon bound for the Russian River are moving through and beginning to concentrate in the Upper Kenai. The run usually lasts through the month with the peak likely between the 15th and 25th. The great thing about the early run sockeye is that they all arrive chrome bright, fight like demons, and are exceptionally tasty. 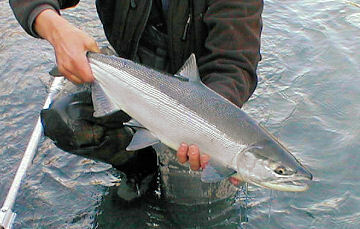 King Salmon are moving through the Lower Kenai and Kasilof Rivers. They are also typically bright and full of fight. While we don’t focus a lot of effort fly-fishing for Kings, we do chase them occasionally. Some of our guests fly fish for trout and sockeye for a few days and then opt for a gear trip to try and land a big King Salmon. One bonus in June is the long “daylight” days (almost 20hrs on the Solstice). You can fish a typical full day and have plenty of time for added sightseeing. You can also fish until you drop.